Smart Books World is the home of cutting-edge educational products. It incorporates SmarteBooks. Read about a new type of comic book that teaches as well as entertains. 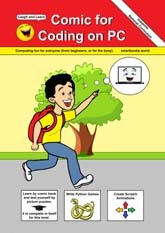 The paperback comics teach Coding and more, and are for all main devices** and computers. They are the first in the Laugh and Learn series. See, also, the ebooks which teach Maths (SATs - GCSE - A-Level), English (to GCSE), and TEFL (speaking English), and the apps on A-Level Maths, Physics and Chemistry, and on Coding. 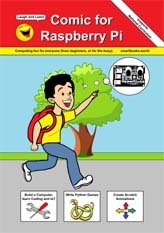 This paperback comic book for the Raspberry Pi makes Coding so easy that even a child could understand it, but it is suitable for everyone, including pupils, students, teachers and the busy. This comic is also ideal if you do not speak English well. It teaches by pictures. While it is designed for beginners, it includes tips for the more advanced users. It is ideal for ages 8-15 years and younger, who would find the books on the subject hard to read. Learn all about the exciting new school subject of Coding, and about the technology of the future, the Internet of Things (IoT). It covers the Raspberry Pi, one of the main computers of IoT which is widely used in schools. Fully illustrated in bright colours on quality, glossy paper. In this full-size comic (A4), you learn by cartoons with speech bubbles, jokes and picture puzzles. You are taught by reading stories in comic book form. Then picture puzzles are used to show you what you have learnt. Computer jokes are included to keep it fun. Follow the adventures of Harry, Tim, Pia, Super Geek and Clank, the robot. Learn how to build a computer, write games in Python, and create animations in Scratch. It includes topics from the National Curriculum and more. It is written by a team led by a published author of many Paperback Books (all educational), such as the bestselling Brainteasers range of books, that also teaches you to program (code) by showing you how to write games. Posted within 24 hours after the websites receive your order. Learn all about the exciting new school subject of Coding, and you can learn and practice coding on the PC that you already use. Enjoy reading this paperback comic book, then when you have finished you will have changed from a beginner to an even more advanced Coder. (This is the comic book that covers the most advanced coding). 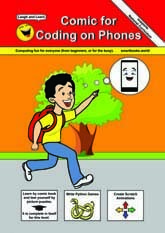 The comic makes Coding so easy that even a child could understand it, but it is suitable for everyone, including pupils, students, teachers and the busy. This comic is also ideal if you do not speak English well. It teaches by pictures. You are taught by reading stories in comic book form. Then picture puzzles are used to show you what you have learnt. PC Computer jokes are included to keep it fun. Learn how to write games in Python, and create animations in Scratch. Learn all about the exciting new school subject of Coding, and you can learn and practice coding on the phone that you already have (your Android smartphone or iPhone). While it is designed for phones, it is also suitable for Android tablets and iPads. Enjoy reading this paperback comic book, then when you have finished you will have changed from a beginner to a more advanced Coder. You are taught by reading stories in comic book form. Then picture puzzles are used to show you what you have learnt. Smartphone (and iPhone) jokes are included to keep it fun. * = For example, Crunch Comics, Harris Arcade, Reading, Berkshire. ** = The comic is available from the vendors listed while stocks last. Email Smart Books World for extra copies if they are sold out. See Launch Dates, if any. This website is optimised for smartphones and e-readers.